AppleInsider reader David reached out on Friday to reveal that a new 3.8 update is now available for systems running the second-gen Sync with MyFord Touch. Included in the update is support for Siri Eyes Free. "With simple voice commands, Sync with MyFord Touch enables you to operate the iPhone and Sync together," the release notes state. "Siri Eyes Free can be activated by pressing and holding the voice button for at least 3 seconds." In addition, the update also makes iPhone pairing easier, and will now automatically reconnect to a handset if it is disconnected. Installation of Sync 3.8 is said to take up to 30 minutes to complete. Ford vehicle owners must register and sign on to the automaker's website to check for updates. 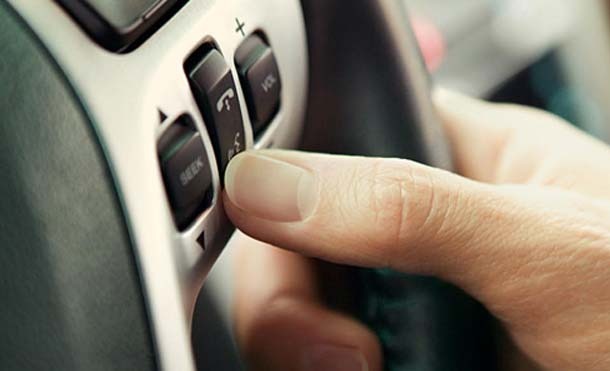 MyFord Touch featuring Sync second-gen is actually Ford's outgoing infotainment system, having been in vehicles sold by the company since 2011. It and the first-generation versions of Sync were powered by Microsoft. Ford's new Sync 3 system, however, ditches Microsoft and will be powered by QNX software from BlackBerry. It debuted on the company's new 2016 Escape and Fiesta models, and like the newly updated second-gen hardware, it also supports Apple'S Siri Eyes Free. Siri Eyes Free was actually announced by Apple back in 2012, but Ford was not among the initial supporting partners. It has been available since the launch of iOS 6. Apple has since debuted a much more full-featured iPhone-based infotainment platform dubbed CarPlay. Ford officials have said they plan to support CarPlay within the new Sync 3 platform, but have not given any details on a launch. Legacy Microsoft-based Sync systems will not be able to support Apple's CarPlay. With Hands Free, the iPhone screen stays off, so it will not distract the driver. Since Siri talks back to a user out loud, drivers can control many functions on their iPhone with just the press of a button and the use of their voice, allowing them to keep their hands on the wheel and their eyes on the road.